WEST LAFAYETTE, Ind. 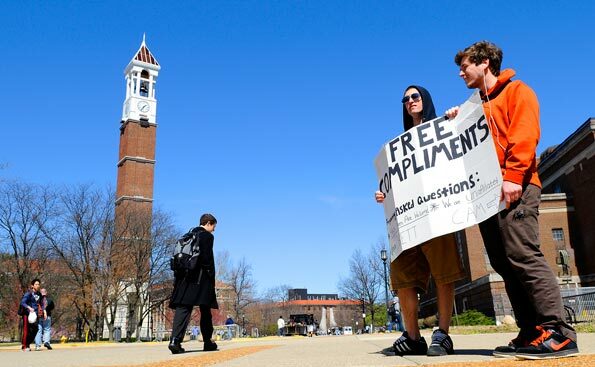 — The Compliment Guys, two Purdue University undergraduates whose weekly campus compliment campaign gained international attention, are headed on a 10-city tour to brighten the days of people from New Orleans to New York. Brett Westcott, a junior from Plainfield, Ill., and Cameron Brown, a junior from Toledo, Ohio, kick off their RV road trip on Monday (July 20) in the Big Easy. The tour ends July 31 in Rochester, N.Y. Along the way they will share their adventure online with photos, videos and blogs at http://www.BrightSideTour.com and on Twitter at @ComplimentGuys. “I thought it would end there, but spreading good cheer, especially in uncertain times, is contagious,” Westcott said. Follett’s Book Stores in West Lafayette provided the Compliment Guys with Purdue athletic wear for the trip, and Purdue alumni clubs have been invited to meet the guys when they come to a city near them. The Rochester date is now TBD. Follow the guys on BrightSideTour.com for updated info.